At the Tree House, we ordered an omelet and settled in with pillows, hammocks and a picturesque view of the ocean. Our omelet was beautiful. The egg rose and dipped like gentle waves crashing onto a sandy beach. However, the inside of the omelet was the opposite of beauty and grace. I felt like a kid who’s wooed by the calmness of the water, then jumps into the waves, crashing through the gentleness to find a world of violence and suffocation, scared and being pulled out to sea. Every bite of omelet brought me closer to revisiting the memories of my near death drowning. I couldn’t handle the taste of the omelet. The omelet was filled with an unexpected salty tomato sauce with small bits of cooked vegetable. It made my taste buds cry and my lungs panic. 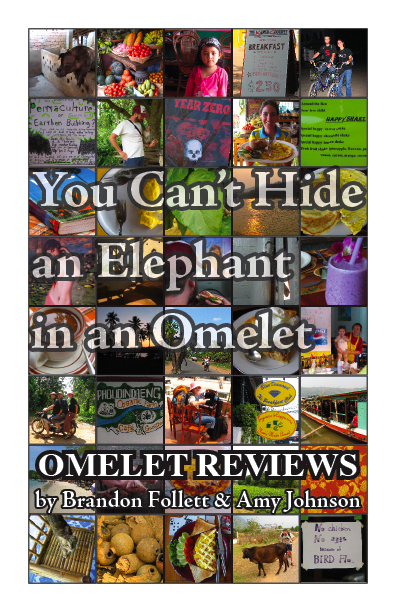 Sometimes all a person can do is toss the omelet, enjoy a fruity drink and write an omelet review. UPDATE: This video will appear on the Travel Channel in the pilot of “What’s Your Trip?” hosted by Anthony Bourdain. It will air Monday, May 21st, 2007 at 8PM and 11PM. This video was filmed in the rural, low-income, rice-growing region of Thailand known as Isaan, where few foreign travelers venture. We went there two weeks into our Thailand travels in order to volunteer on an organic farm. Before traveling to Thailand, a Thai friend in the States warned me about our plans to volunteer on a farm in Prakonchai, Thailand. She wrinkled her nose at the thought, saying that the people of northwestern Thailand talked funny and ate gross food, such as fermented fish. She said this region was like the Texas of Thailand. For ten days, we stayed near Prakonchai, working on the farm and living with a Canadian man, his Isaan wife, and their two children. Our farm work included cutting rice, raking straw from the rice fields, and scooping up water buffalo manure to mix into compost. Since we don’t speak Thai, we couldn’t tell if the people spoke standard Thai or not, but they do speak their own local language in addition to Thai. The food was good, but it was definitely different from the meals we’d eaten at Thai restaurants in the U.S.
One afternoon, our hosts took us with them to the local market. The fruits and vegetable stalls were piled high with various shapes and colors we’d never seen before. The meat section was fresher, bloodier, and included a lot more animal heads than we were accustomed to seeing. We were also fascinated to see all sorts of fried insects for sale, with the vendors sitting nonchalantly behind their neatly organized displays of fried bugs. Our hosts’ five-year-old daughter loved the tasty snacks and munched her way through a bag of fried insects while her parents did their shopping. Brandon also purchased a variety bag of bugs and enjoyed their flavor and crunch. He wanted to share his delight on camera, so we filmed “An Afternoon Snack.” The film was made in a moment of pure Follettry. Special thanks to Stacy McBain for giving the English language the word “Follettry.” How have we managed for so long without it? A short film about a young man traveling through SE Asia scared of strangers. Enjoy original music by Brandon Follett, now available in ringtones that are sure to put a smile on your face.